the cost of criminal justice in Shelby Co., Tenn.
After the death of her husband in 1997, Gloria Rodgers found it hard to cope, and her life took a negative turn. She developed a $2,000-a-day crack addiction in less than a year, and in 1999 she was arrested for charges that included identity theft, forgery, and theft over $1,000. Rodgers said that her struggle with drugs and her eventual arrest led her to reach out to God for divine intervention. “When I wanted to get out of the drug lifestyle, I was hopeless; I could not figure out how I could get away from it…. The drugs definitely had me a prisoner,” Rodgers said. She said one day she cried out to God and said, “I want out, and if you want me out, you get me out. You have to, because I can’t.” That night, she went to jail. Once her release began to draw near, though, she wondered about her next step. “I didn’t know where I was going to be going, because I didn’t have any place I could go,” Rodgers said. While in jail, Linda Lee White, the founder of Women Ablaze Ministries, told her about the housing program the ministry was offering for female ex-offenders. Rodgers jumped at the chance, and in 2001, she became the program’s first resident. Rodgers said that being in a faith-based program was essential to her getting her life back on track following her addiction and stint in jail. “If I hadn’t been in a faith-based environment and if I hadn’t been in an environment where it’s a matter of willpower, I couldn’t have done it,” Rodgers said. Today, she serves as the program’s house manager. She said she’s the “eyes and ears” for White and if any issues come up, she reports them. She said she was able to get the position because of the mutual trust she built with White during her time as a resident in the program. Although Rodgers was able to find a place where she could stay and start over, other ex-offenders may not be so fortunate. Natasha Morgan, re-entry and career-development specialist for Shelby County mayor Mark Luttrell, knows how difficult it is for women who need help to get it. According to the Tennessee Department of Corrections website, there are over 80 different Tennessee Board of Parole-approved houses. Fifty are in Middle Tennessee, 32 are in Nashville, and only 12 known transitional houses exist in Memphis. Although there are fewer housing programs in Memphis than the other cities, the Bluff City facilities offer ex-offenders a second chance by providing different resources to those trying to re-enter into society. Women Ablaze Ministries, Forgiveness House, and Karat Place are three of these programs. The process to get into them includes inmates being referred to them and an interview process to determine if that person meets the requirements for a particular home. “Inmates come to us and based on the information in their letter we give them our brochure and a list of housing information,” Rachel Ivory, office assistant for Urban Family Ministries, said. White said that she examines potential residents’ involvement while they’re in prison in order to determine if they’re right for the program. “If they haven’t started a significant change while they were incarcerated, then they’re not going to change once they get out,” White said. For women who want to make a change like Rodgers did, Women Ablaze Ministries offers resources such as mentoring, life skills training (such as money management, job readiness and relationship skills), drug and alcohol relapse prevention (through networking with other agencies and ministries), and Bible studies/worship services. The ministry has two houses, and helps about 10-15 women a year. Residents usually stay in the program for six months to two years. Rodgers said her past as an ex-offender helps her connect with the women that are involved in the group home program. Rodgers noted from experience that female ex-offenders can face challenges and misconceptions following their release from prison, especially employers not wanting to hire them. She also said that men may try to take advantage of a female addict, based on their perception about how she may have financed her habit. However, Rodgers said that being involved with Women Ablaze Ministries saved her life, and she encourages other women to take advantage of programs like it. If women are accepted into Melvena Leake’s Karat Place, a non-profit residential rehabilitation program for homeless female ex-offenders, they have access to computer courses, and they can undergo any necessary treatments and counseling there. Karat Place operates a 16-bed facility and has helped over 70 women since its beginning. Leake said that running the place can be challenging, especially when some women try to abuse it. “The most challenging part [about working with female ex-offenders] is when I can see that they’re trying to use me, and not use the program,” Leake said, noting that some of the women may make excuses as to why they can’t do things, such as work. However, there are women who have used Karat Place as a chance to turn their lives around. A former resident, “C.B.,” who resided there from 2005-2006, is one of them. She is a former juvenile court supervisor who suffered from a crack-cocaine addiction after being introduced to the drug by her boyfriend at the time. She was terminated from her position after failing to show up to work. Then, after being arrested in 2005 for drug possession, she spent 30 days in jail and was then sentenced to residential treatment at Karat Place. In addition to treatment, C.B. said that being involved in Karat Place gave her the opportunity to brush up on important skills that she’d lost over the course of her addiction. “Because I was on drugs, I had forgotten a lot about computers and job skills, but while at Karat Place, I was able to regain my computer skills, I was taught interview skills, job skills, and how to get back into society to become a productive person,” she said. Although C.B. was able to return to her home after being released from Karat Place, she recalled that her jail record and lack of computer proficiency initially made it challenging to find employment. She now works as a secretary for a General Sessions Criminal Court judge in Memphis, a position that she’s held since 2010. “Besides God, if it was not for Karat Place, there’s no telling where I would be today,” C.B. said. Forgiveness House is a transitional house for male inmates coming out of jail. Opened in January 2007, the facility tries to help at least 25-30 men a year, but that depends on the number of beds that are available. Bob Sauter, the manager of Forgiveness House, said that the program wants residents that are serious about turning their lives around after being released from jail. 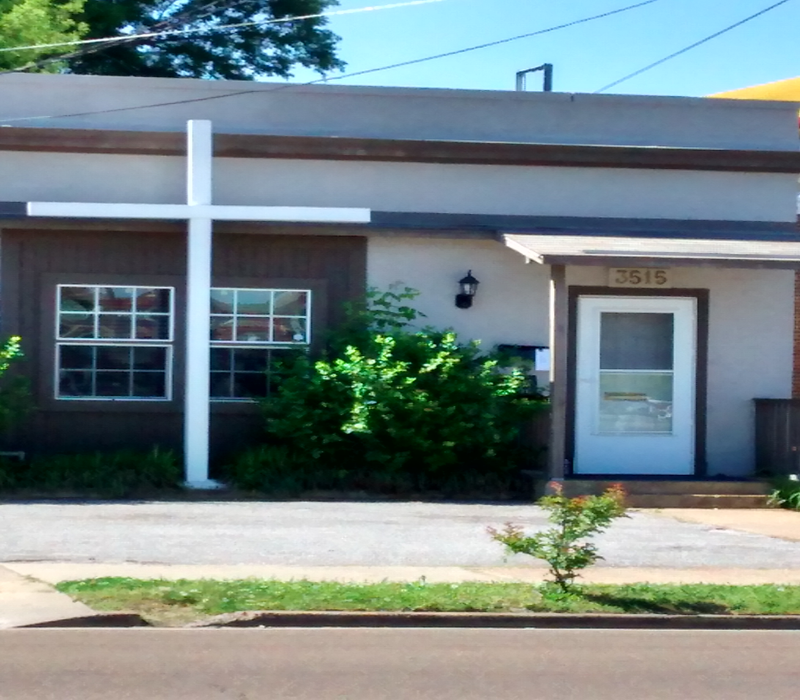 Forgiveness House, located at Summer and Highland in Memphis, offers transitional housing for men. “We want guys who want to get out and stay out,” Sauter said. The house holds 12 rooms that are the size of jail cells. However, each room contains a warm bed, dresser and nightstand. Anyone who lives here also has to have a steady job because the rent is $130 a week. “However, when you first get out Sauter takes everyone to the DHS office to file for food stamps. This helps to take $87 dollars off of the rent,” Cleveland Nash Jr., a resident of Forgiveness House, said. At Forgiveness House, there are several ex-offenders who are given a place to stay on a daily basis. When it came time for Nash, who was arrested for aggravated burglary, to come out of jail, he was ready. He did not pick Forgiveness House, though; he was forced to go. “I was told by my parole officer that I had to go to a transitional house for 90 days and Sauter was there to help me out,” Nash said. Nash explained that when it comes time for him to rent a house, because he is in no position to buy, he has to let whoever he stays with or rents from know that he is a parolee. “The way I was told was that they have to approve that I can stay or I can’t live there, because it has to be processed,” Nash said. Sauter said that his program has made a difference in its residents’ lives. He noted that people who were once in gangs and who have had violent pasts are now going to church, he said, and having the word of God in their hearts. Leake also has faith in her program, and she said that she enjoys seeing the transformation that the residents can make. “The most rewarding part is seeing them change before my eyes, become better, and do the things that they need to do,” Leake said. Excellent article. I hope it will make people realize that although ex-offenders are helpless, when they are released from prison, they are certainly not hopeless! Memphis needs more transitional housing options. Also, I am praying that people who read this article, and have the means to help financially, will donate money to these existing non-profits, so they can grow their facilities and staffs to help more ex-offenders, who want to start over, the right way.